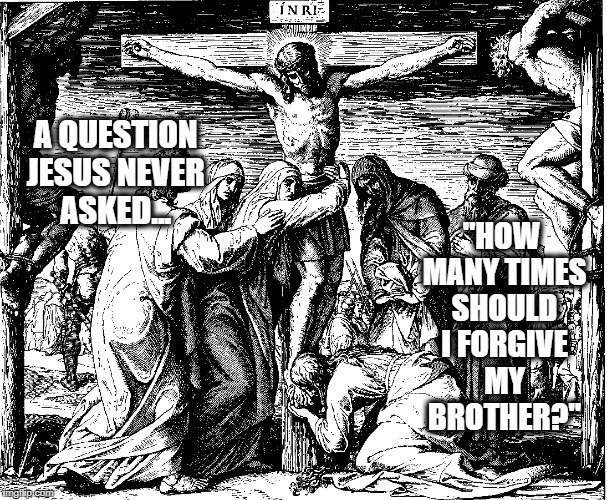 Matthew 18: Then Peter came up and said to him, “Lord, how often will my brother sin against me, and I forgive him? As many as seven times?” 22 Jesus said to him, “I do not say to you seven times, but seventy-seven times. 14 Since therefore the children share in flesh and blood, he himself likewise partook of the same things, that through death he might destroy the one who has the power of death, that is, the devil, 15 and deliver all those who through fear of death were subject to lifelong slavery. 16 For surely it is not angels that he helps, but he helps the offspring of Abraham. 17 Therefore he had to be made like his brothers in every respect, so that he might become a merciful and faithful high priest in the service of God, to make propitiation for the sins of the people.